5 Rich Autumn Invitations to Kick Off Your Wedding Planning! Soooooo it’s still August, but you know what that means? Autumn is just a hop and a skip away. And so, this month, we’ll be focusing on all things autumn to get you prepped for this wedding season, whether you’re planning a full 12 months out or are only a few away! How excited are you? Very? Mmkay, good. You should be. You’re GETTING MARRIED! Autumn brings with it a lovely cool-down after summer’s heat that makes it the cosiest of months. Autumn = automatic atmosphere. As temperatures drop, the colours deepen to rich hues of burgundy, burnt orange, red-rose red, emerald green and dark blue. You can also jazz up any colour scheme with lovely golds and creams. The wonderful thing about weddings during this season is also all the lovely details, such as soft shawls for your bridesmaids, romantic candles and hanging twinkle lights, dashingly dark suits, a fire burning in the hearth and more. Here are 5 autumn invitations to kick off your autumn wedding celebration. 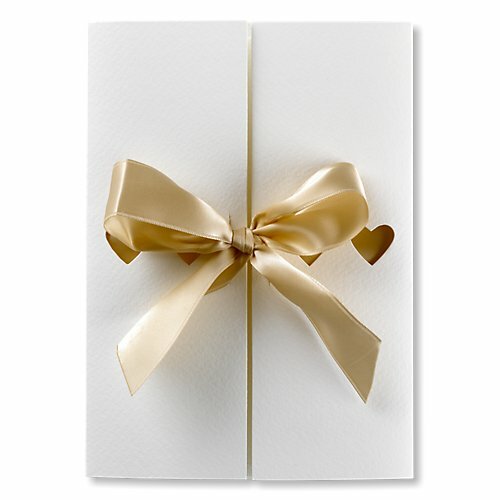 Whether it’s your main or accent colour for your wedding, you cannot go wrong with this super-sweet Ribbons Day Invitation in Gold that has to be untied before revealing all the goods inside! Love the heart cut-outs, too, in the same colour as the ribbon. 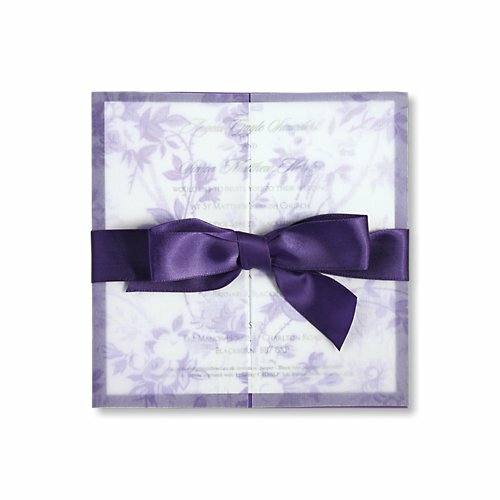 Featuring a subtle, semi-transparent vine pattern on the outer layer, the vintage-chic Jasper Evening Invitation in Purple brings so much charm. 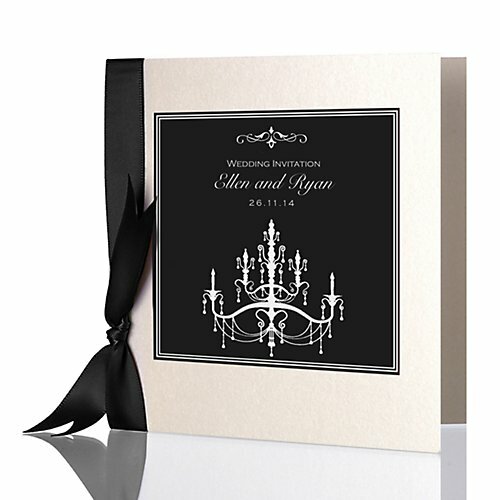 The gatefold design means that there is an opening in the middle (all wrapped up with a pretty satin ribbon) and both sides open to the wedding details within it. Well, there is one colour that goes with every season but is EVEN MORE dramatic when paired with this season. Why? Well, just picture chandeliers and fireplaces and large centrepieces filled with greenery and then add dramatic black everywhere. Yes, ma’am. Oh-so chic. Speaking of chandeliers, this Crystal Evening Invitation by Mandalay dons the motif along with elegant lettering and a satin ribbon. Plus, how cool is the reversed look of the matching reply card?! We adore this Festival Evening Invitation with a signage theme that is made luxurious with letterpress. It’s perfect for a whimsical wedding and a couple who enjoys something untraditional and out of the ordinary. 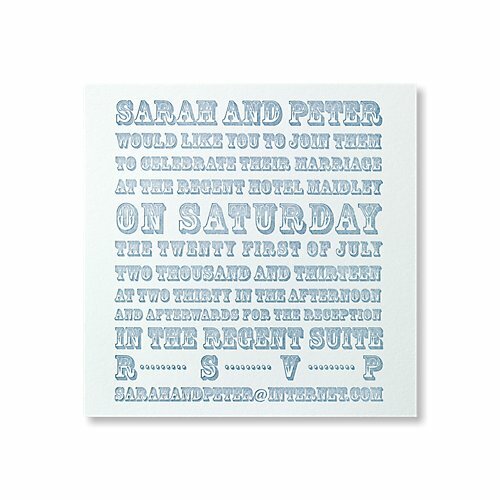 Sadly we no longer stock this lovely design, however we are been busy updating our wedding stationery ranges in time for the 2018 wedding season! You’ll be sure to discover the perfect card picked out from our collection of wedding invites. 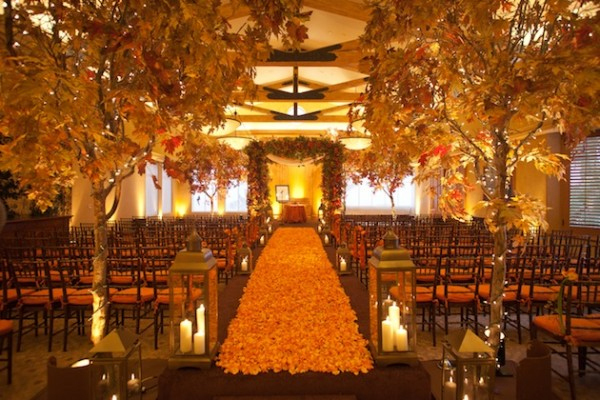 What colour scheme are you considering for your autumn wedding?